Source: The Greenwich Press. Thursday, May 8, 1930. Page 10. Captain Matthew Mead Branch, No. 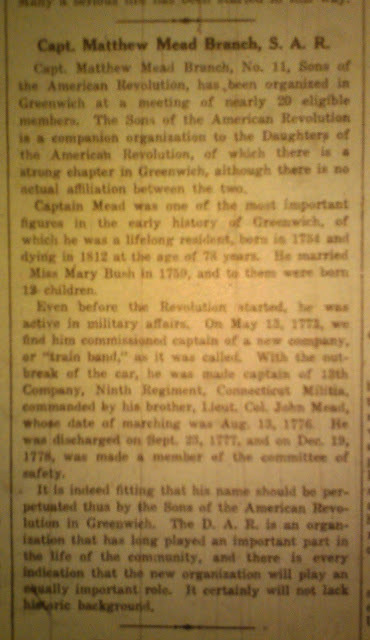 11, Sons of the American Revolution, has been organized in Greenwich at a meeting of nearly 20 eligible members. Th Sons of the American Revolution is a companion organization to the Daughters of the American Revolution, of which there is a strong chapter in Greenwich, although there is no actual affiliation between the two. Captain Mead was one of the most important figures in the early history of Greenwich, of which he was a lifelong resident, born in 1734 and dying in 1812 at the age of 78 years. He married Miss Mary Bush in 1759, and to them were born 12 children. Even before the Revolution started, he was active in military affairs. On May 13, 1773, we find him commissioned captain of a new company, or "train band," as it was called. With the outbreak of the war he was made captain of the 13th Company, Ninth Regiment, Connecticut Militia, commanded by his brother, Lieut. Col. John Mead, whose date of marching was August 13, 1776. He was discharged on September 23, 1777, and on December 19, 1778, was made a member of the committee of safety. It is indeed fitting that his name should be perpetuated thus by the Sons of the American Revolution in Greenwich. The D.A.R. is an organization that has long played an important part in the life of the community, and there is every indication that the new organization will play and equally important role. It certainly will not lack historic background. Source: The Greenwich Press. Thursday, May 8, 1930. Page 2. 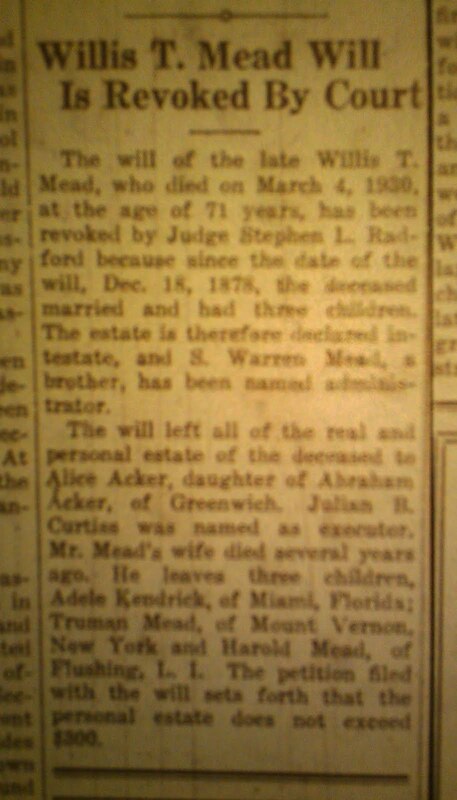 The will of the late Willis T. Mead, who died on March 4, 1930, at the age of 71 years, has been revoked by Judge Steven L. Radford because since the date of the will, Dec. 18, 1878 the deceased married and had three children. The estate is therefore declared intestate, and S. Warren Mead, a brother, has been named administrator. The will left all of the real and personal estate of the deceased to Alice Acker, daughter of Abrahim Acker, of Greenwich. Julian B. Curtiss was named as executor, Mr. Mead's wife died several years ago. He leaves three children, Adele Kendrick, of Miami, Florida; Truman Mead, of Mount Vernon New York and Harold Mead, of Flushing, L. I. The petition filed with the will sets forth that the personal estate does not exceed $300.